On January 21, USTA Eastern will honor 28 volunteers, tennis pros, players and organizations at its Annual Awards Dinner at the Renaissance Westchester Hotel in White Plains. Among those being honored is Pablo Sierra of Brooklyn, NY, who will receive the USTA Eastern Multicultural Participation Leadership Award. We asked Pablo, who founded the South Brooklyn Tennis Association, about his introduction to the tennis, his efforts to increase multicultural participation and his views on the potential for growing tennis in New York City. This year, you are being honored with the USTA Eastern Multicultural Participation Leadership Award. How do you feel about receiving the award? I feel honored receiving the Multicultural Participation Leadership, but honestly when I get the opportunity to participate in an event, to me it’s just plain fun. I plan continuing to promote the game of tennis to all groups, especially those that may have never been exposed to the game. When and where did you first start playing tennis? How did it become a part of your life? I first became interested in tennis while watching it on Channel 13. At the age of 14, I had the opportunity to see such greats as Billie Jean King (my favorite), Rod Laver, Arthur Ashe, Roy Emerson, Roscoe Tanner, Ilie Nastase, Virginia Wade, etc… I could not get enough of it. I first went out and purchased a how to play tennis book, and then one day, I was hitting against a wall at the Red Hook Stadium, when a golfer, named Sonny Liske, who was in Red Hook doing a golf clinic, directed me to someone with the NJTL where I continued to learn the game. And now with the new 10 and Under Tennis, and modified equipment, teaching tennis is a lot more fun. I loved the movement and grace on the court, I loved the strategy involved in playing a point, game, set and match. It is a difficult game to learn, because of all the various movements. It is a game which stresses concentration and focus; otherwise it becomes pretty difficult to sustain a rally. I joined the USTA, which, at that time was called the USLTA, United States Lawn Tennis Association. Currently, I serve on the board of USTA Eastern’s Metro Region as the Brooklyn Representative, and as Chair of the USTA Eastern Volunteer Committee. Being involved with the USTA really continues to keep my “juices” flowing. What programs have you worked on that have helped grow multicultural participation in tennis the most? What was the key to their success? Being involved with tennis has also made me a part of the newly formed Volunteer Committee, where we have the opportunity to also promote the game of tennis. This past year was a fun year because we participated at the US Qualifiers, in the Bronx working with the Hispanic Federation and American Diabetes Association. I thoroughly enjoyed working with them. I feel as if I have known them forever. 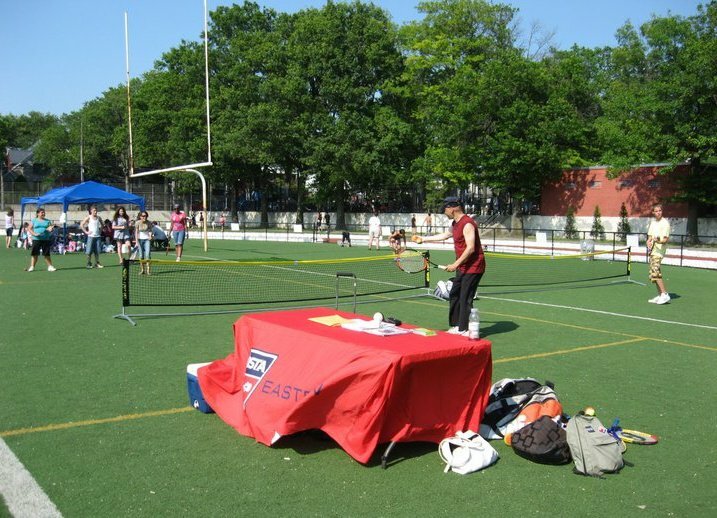 What areas in New York City have the greatest untapped potential for growing the sport of tennis? NYC has many untapped areas. Just look at the numbers of people and relate them to the number of courts. Now factor in kids and schools that had their budgets cut. I am working with my South Brooklyn Tennis Association to bring tennis into the schools. Tennis should be promoted in all the boroughs. The timing is right to promote the game. We need to develop tomorrow’s tennis champions and that begins with kids. However, tennis has a wellness factor if you think about it. I promote tennis to the American Diabetes Association as means of helping individuals manage their glucose levels, or playing tennis to reduce stress and the risk of heart attack, as it is a lifetime sport. Personally, I became a Type 2 Diabetic in 1996, and if I can help individuals manage their glucose levels – both kids and adults – I will, especially using the modified equipment. What is your most important goal for 2012 and why? My most important goal for 2012 with relation to tennis is quite simple. PROMOTE, PROMOTE, PROMOTE, time permitting. I sincerely believe that America’s next champion may have gotten his/her first start on a playground. The hardest part of promoting is the transporting, and packing of equipment, because when I travel I travel heavy with a lot of equipment. The dinner marks the end of USTA Eastern’s Annual Meeting and Volunteer Development Workshop, January 20-21, 2012. The meeting this year will feature sessions on grant writing, running USTA sanctioned tournaments and teaching 10 and Under Tennis. There will also be opportunities for participants to network with other volunteers, instructors and providers throughout the section. To register for the meeting or support these awardees at the dinner, click here.